I showed you a sketch of the Sea Star on Thursday, but that wasn’t the boat I was looking for when I came to Fishermen’s Terminal this week. The Discovery Channel show chronicles life aboard five crab boats and their crews on the Bering Sea. Have you watched it? Striking footage shows vessels crashing into towering waves and deckhands working around the clock in extreme weather conditions. I lucked out meeting captain Dennis Thompson, who was very gracious about answering my questions and gave me a tour of the “Mystery Bay,” where contractors were working on maintenance upgrades to get the boat ready to sail off to Dutch Harbor, Alaska, on October 1st. 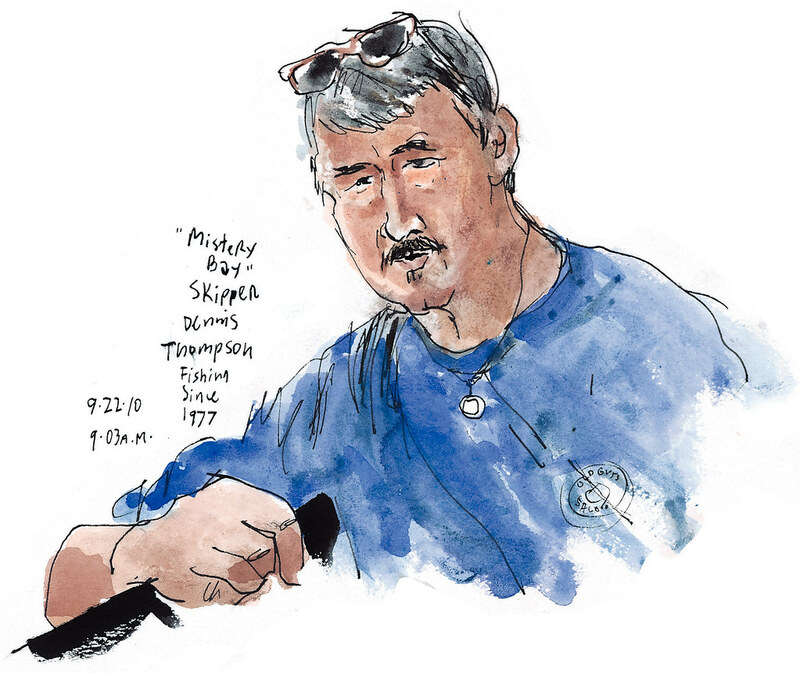 Thompson, who grew up in Westport and now lives in Snohomish County, has the same job as the skippers you see on the reality series, minus the cameras. 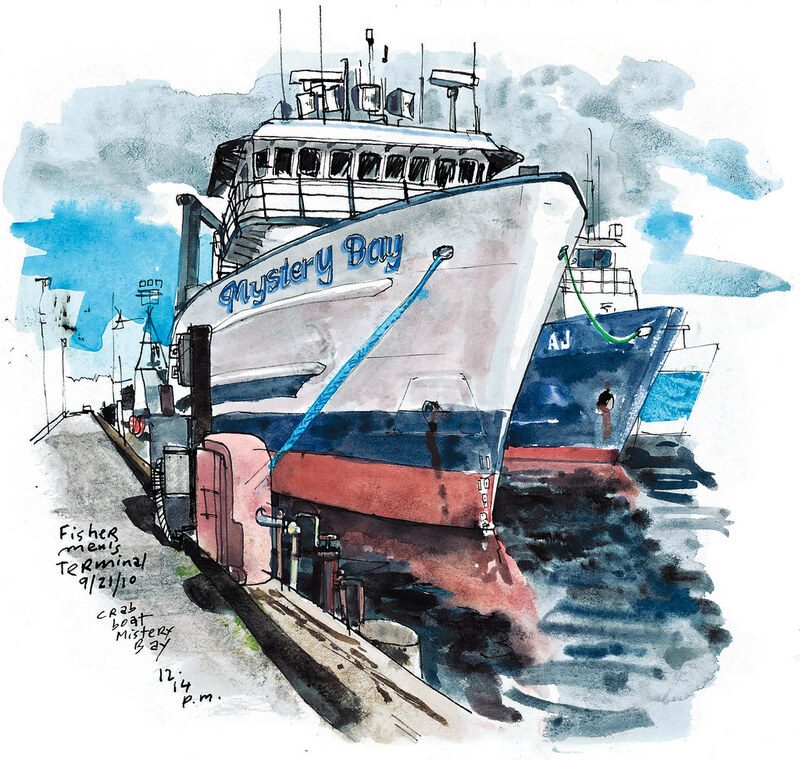 The Mystery Bay is one of 35 Seattle-based crab boats that will be fishing in Alaska by mid October, when the king crab season opens. Thompson is looking forward to it. “I gotta get a little salt in my veins and on my face — breathe a little salt air.” He has been fishing in Alaska since 1977 and was 22 when he first took the helm of a crab boat. You can learn more about our local fishing community during Saturday’s 22nd Annual Festival at Fishermen’s Terminal (11 a.m. to 6 p.m.) Visit www.seattlefishermensmemorial.org for more information. COMING UP: If you like Lego, I’m sure you’ve heard of BrickCon. It’s coming to Seattle Center next week.